We’re living in a time when a lot is churning, and some old assumptions about the way life is supposed to be are turning out to be less than reliable. As an activity that changes the land, large-scale sand mining has social as well as ecological considerations for Wisconsinites to ponder. While seven out of ten Americans believe climate change is real, most have a difficult time understanding how it affects them—and what they can do about it. 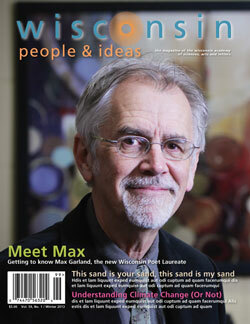 Meet Max Garland, the Wisconsin Poet Laureate for 2013-2014. There’s a body at the bottom of the lake. Probably many. The way you react depends on your definition of the word natural. Probably also on your moral compass, but I can’t just start with bodies. Life is about having stories. Michael Perry is upset. The county highway commission wants to reconfigure the patch of road near his house, making it impossible for cars to climb the hill to his home in the winter.